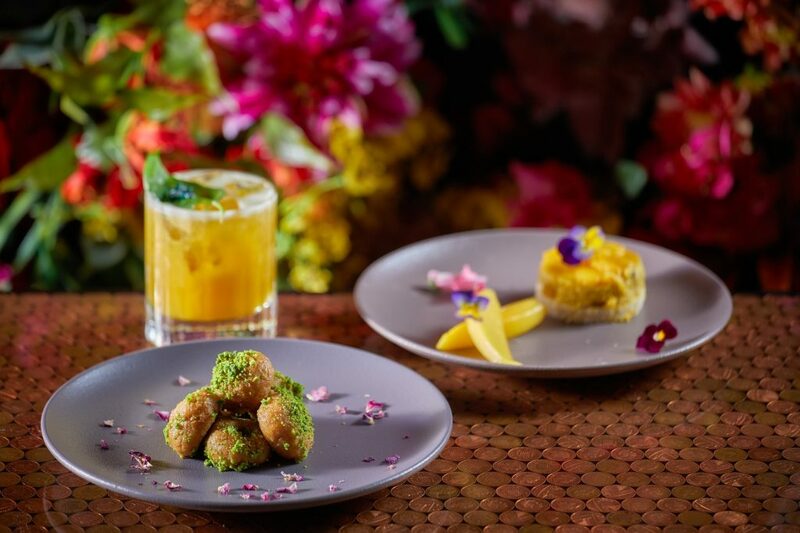 The Perception at W Hotel London is hosting London chef Ravinder Bhogal with her one-time vegan menu through June. 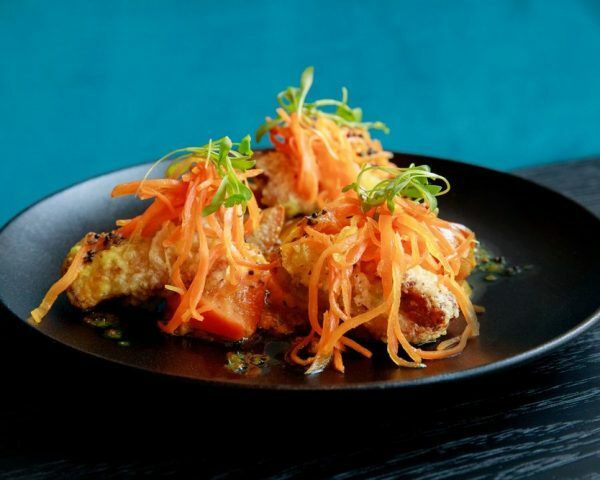 The venue is cool and vibrant; the menu is all about strong flavours and turning around the misconception that vegan food is unexciting. It is anything but here. Bhogal was born in Nairobi to Sikh parents but moved to Kent where she grew up. Her mother taught her to cook and early on she knew all about using spices, which clearly stuck fast; Her creations, both in her Marylebone restaurant JIKONI and featured in this vegan ‘pop-up’, are certainly about strong, bold flavours: “My food without spices would be like elevator music. My tastes are very global given my own heritage and love of travel so there are lots of Asian nods across the menu,” Bhogal says. So, out of the Piccadilly hubbub, into the sleek lobby of the W London and upstairs to the busy but chic cocktail lounge. To start off we had a summery (vegan) cocktail served in innovative W style – in the shaker for us to whip up, pour and top up ourselves in a shot glass resting on ice. ‘Eagle Eyed Sherry’ was fresh and light, made with Star of Bombay gin, Tio Pepe, sake, St Germain, yuzu, apple and chamomile honey. So refreshing, I could have taken another of these, but when the plates started coming out rich in smell and flavour, switching to a decent Chilean Chardonnay was smart. Now for those, like me, that assumed a vegan tasting menu would leave with space for pizza on the way home, think again. 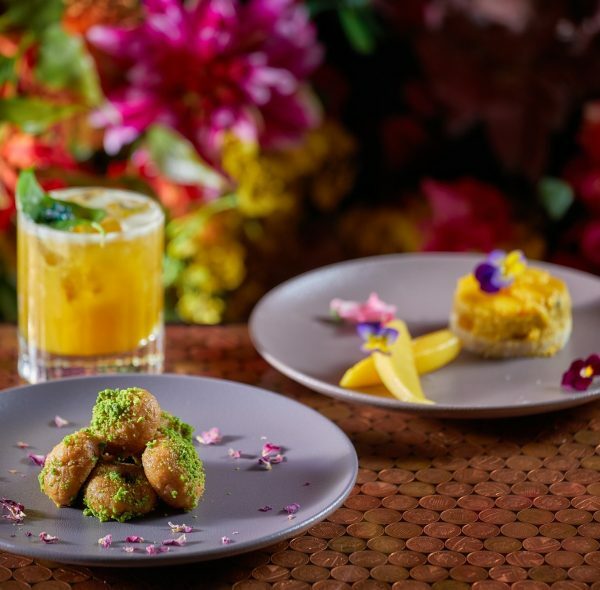 Hearty dishes, strong flavours, generous portions and many courses later, you will be eating your words as well as the rose, coconut and cardamom doughnuts you did not think you could fit in. 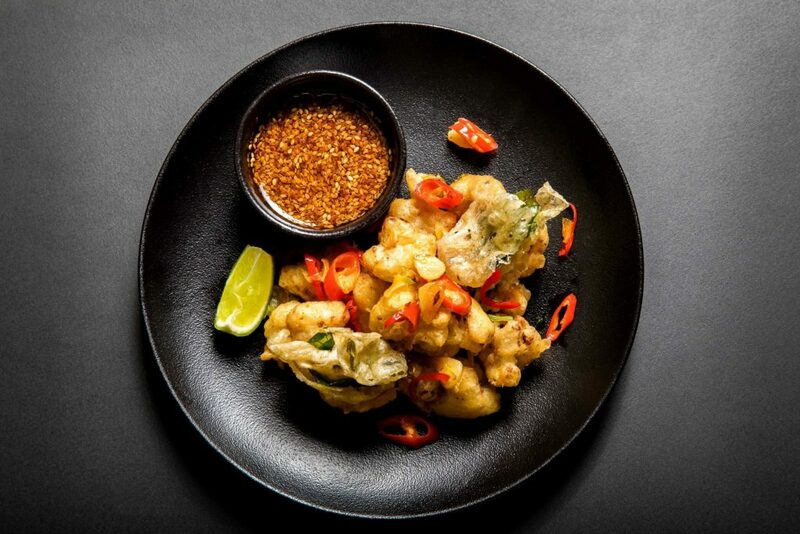 First served was cauliflower popcorn in a Thai basil tempura. Cauliflower spiced up in any way is a treat in my eyes, and extra flavour came from the black vinegar and chilli dip. A strong, if not light, start. The second dish stole the show early on for me; A beetroot and walnut kibbeh, a Lebanese croquette traditionally made from minced meat – lamb, beef or goat – and bulgur. The nutty texture of this dark purple vegan version was perfect, and served with the smooth tahini and a pickled chilli for a little smack, it really could not have been a more perfect dish, classic meat kibbeh included. 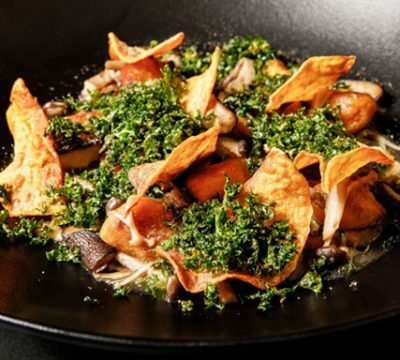 The caramel braised tofu course is really one for the sweet-toothed diner. Generous with the soft tofu, the caramel sauce was very sweet. I think I had a hand-slip serving of sauce to unstick my sticky rice and, interested in three courses yet to come, left space. Apart from the oh-so-silky tofu, it rather made me think of the Thai mango-sticky-rice-condensed-milk dessert, but there was more savoury yet to come. Bhogal names this as her favourite dish, after inventing it for her niece who turned vegan, and claims she could eat it everyday. From the tofu course waiters offered to move to a red (vegan) wine. We stuck on white, interested by food flavours and excited to try the mushroom gnocchi, with a twist of course. 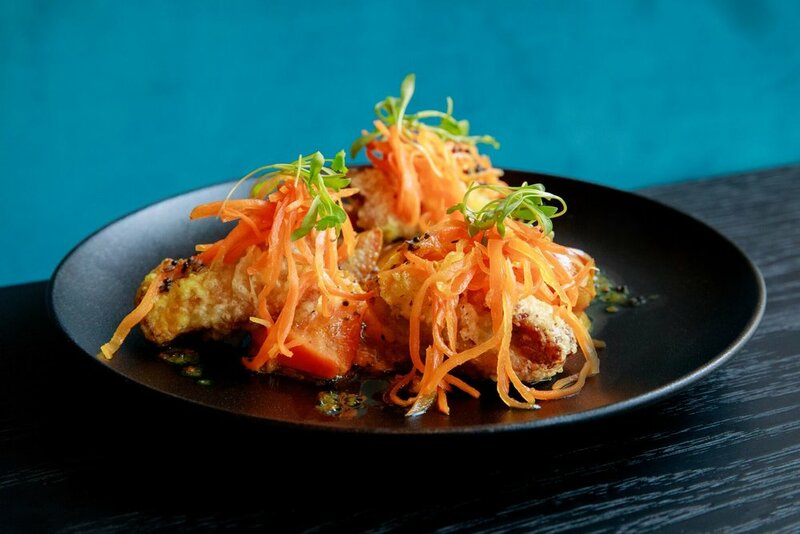 But before that another tempura dish, tempura inari, moong dhal with sweet and sour tomatoes and a tumeric carrot kraut (very good shred indeed). 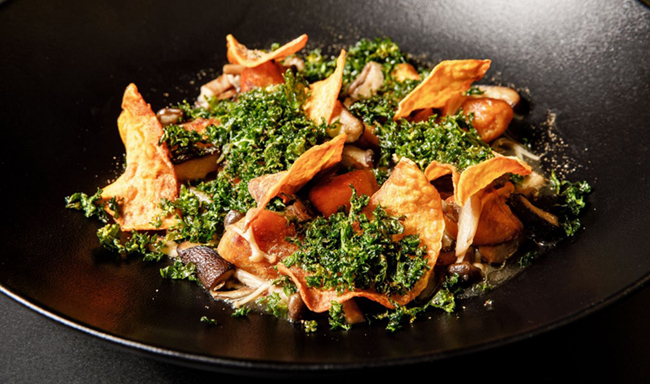 Then the Asian mushroom ‘ragu’ came out – a flavourful broth with small dense parcels made out of sweet potato with crispy kale and sweet potato crisps on top. Fun was had by our neighbours, who had theirs ahead of us, working out the different mushrooms and what actually made up the gnocchi dumplings, which I am sure is a mystery to everyone, so unique. If we are talking taste, which let me reiterate we are for the entire meal, this finish packed a real punch. For a tasting menu the portions are very big – that is no criticism, I am sure many are thinking. But I was wary of finishing in anticipation for the next big flavour hit. “Maybe we should man up,” my dinner date suggested. We both claim to ‘dabble’ in veganism, and perhaps came with skewed expectations and ideas of the lunchtime light veganism. But for a blow out evening meal trying the delights of one of London’s lauded chefs, should not we want to leave completely satiated. Saturated, even? Lastly the sweet course arrived, rose, coconut and cardamom mini doughnuts. And these for me were perfect. Grainy in texture and not sugary sweet, gorgeously served and with subtle natural flavours coming through. During the meal we exclaimed more than a few times that meat was certainly not missed, nor would it be by any taster, vegan dabbler or die-hard carnivore. It really sets the vegan bar high. The menu runs until the end of June, so hurry. 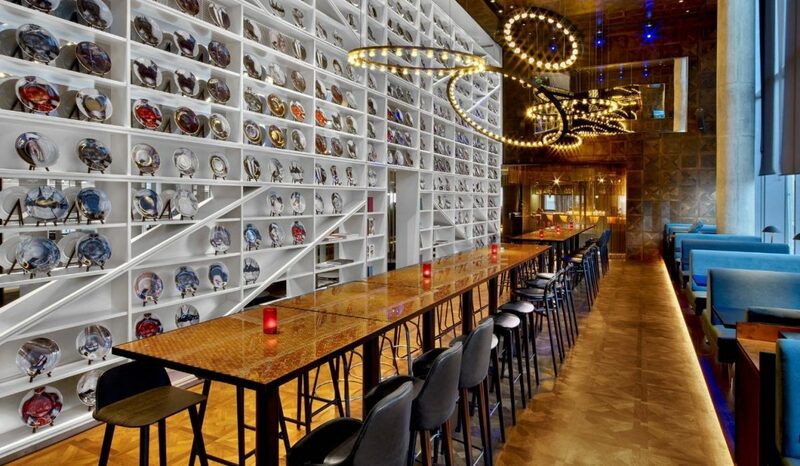 It is perfect for an after work meet and retox, but also easy to reach for non-Londoners in the heart of the city and exactly the stylish haven you are looking for out of the chaos of central London.